Choosing the proper servo motor for your specific application can be a daunting task but TigerTek comes to the rescue with information to help you size a servo motor. Your servo motor needs to be able to provide the required torque, speed, and accuracy in order for an entire system to perform as designed. The right size servo motor for the job is necessary to business continuity - getting your machine up and running and keeping it that way. VisualSizer Servo Motor Sizing and Selection Software (for Windows) by Copperhill Media (free download); The database includes over 6000 motor/drive/amplifier combinations from such manufacturers as Allen-Bradley (Rockwell Automation), AMK Drives, Baldor, GE Fanuc, Mitsubishi, Moog, Ormec, Parker, Schneider Automation, Siemens Energy & Automation, Yaskawa with more being added. TigerTek provides servo motor repair nationwide on major servo motor brands. All servo motor repairs are returned quickly and like new, complete with one year warranty and OEM parts. 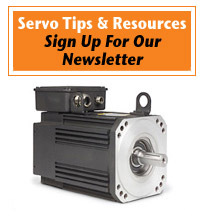 Don’t wait until your servo system needs immediate service - Order servo motor repair now!